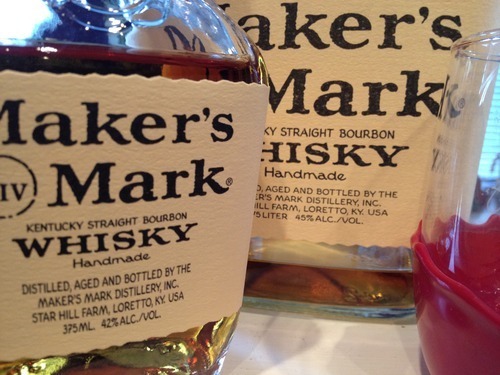 The dust is still settling on Maker’s Mark’s decision to reduce the alcohol by volume of its flagship brand from 45 percent to 42 percent and then back again, but before we move on, I wanted to report on the results of my own taste test. Well, this Maker’s Mark drinker could. Last night, my husband and I conducted a blind taste test, pouring samples of each version in identical glasses (red-wax-dipped glasses, of course) for each other so that I knew which one he was drinking first, and vice versa. We each correctly identified the higher- and lower-proof versions immediately. Most notably, as you might expect, the 84 proof Maker’s didn’t have as much burn as the 90 proof (not that either of them has much – Maker’s is a smooth bourbon). The taste profile wasn’t tremendously different, but we did both get a little more sweetness, more caramel, from the lower-proof version. That wasn’t necessarily a bad thing, mind you. We agreed that the 42abv version tasted pretty good and we’ll finish the bottle. But there is a difference. Maker’s Mark’s current slogan is, “It is what it isn’t.” You might say that the 84 proof isn’t what it isn’t – 90 proof.